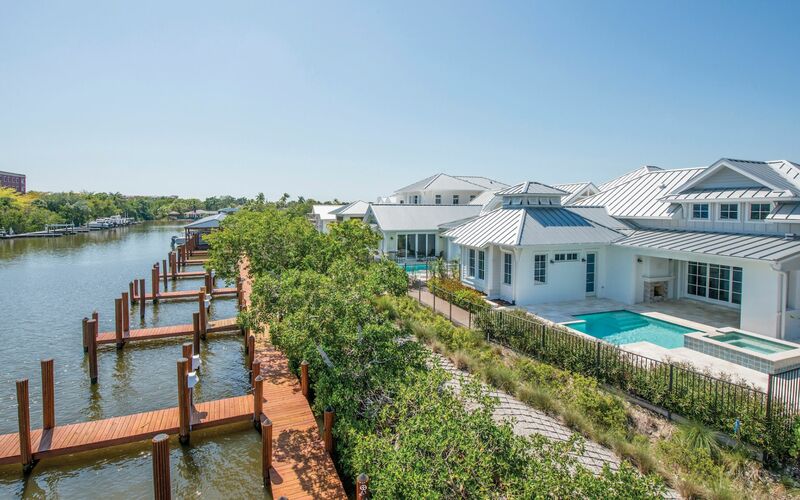 Live along the Gordon River in Old Naples in one of only 53 stunning single-family residences at Mangrove Bay. This is the perfect time to consider a home with these enticing views. Its unique location offers Mangrove Bay residents an unmatched lifestyle including spacious, open-plan homes, each with its own private boat slip. 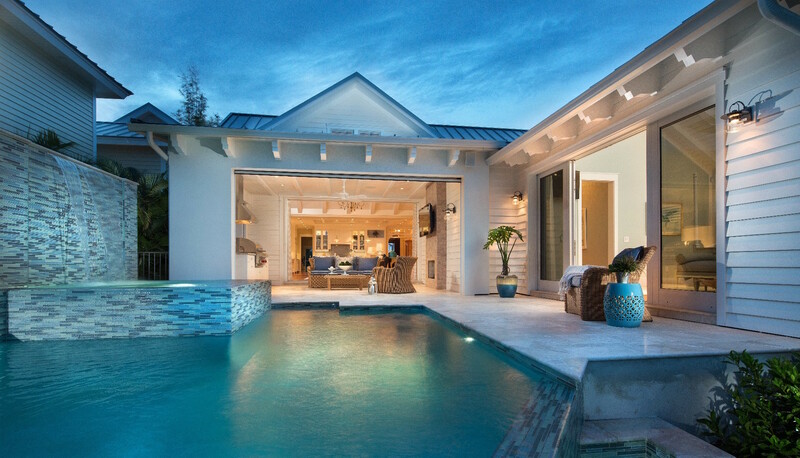 Three elegant model homes at Mangrove Bay are now open—the Keewaydin II and Amelia III Waterfront Residences, and the Sanibel III Courtyard Residence, with a very attractive leaseback opportunity for the Sanibel III and Amelia III models. 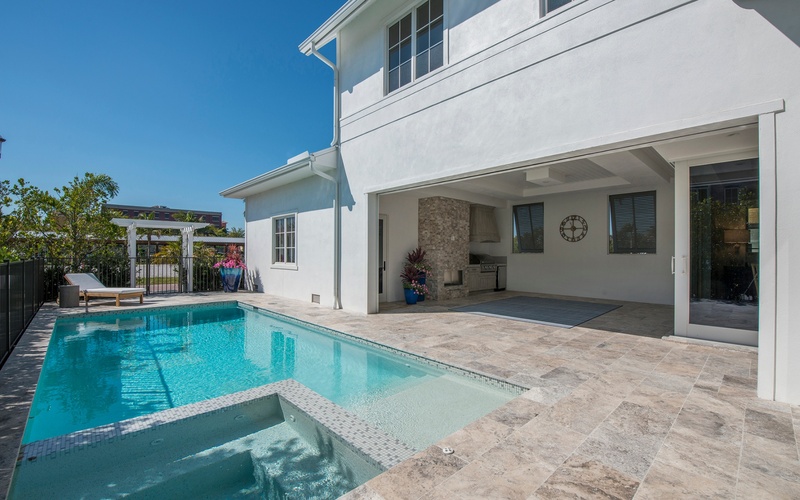 The two-story Sanibel III Courtyard Residence offers a four-bedroom, four-and-½ bath design with approximately 3,331 SF under air, including a private-entry guest cottage with its own spacious deck above the rear-entry garage. The “respite reclaimed” beach-themed aesthetic of the Sanibel mixes dark, light, and weathered wood appointments with soft taupe and cream hues, and natural fabrics that perfectly complement its limed oak wood floors, reclaimed wood accents, tongue-and-groove ceiling detail, barn doors, two-story cupola, French doors, transom windows, and custom moldings and cabinetry. Its ground-floor master suite includes corner-pocketing sliding doors, which open to the lanai surrounded by tropical landscaping, a soaring 1 ½-story covered outdoor living area with fireplace, and a pool and spa with a gently flowing water feature. An attractive leaseback. This tranquilly appointed home is available for sale. The Amelia III Waterfront Residence, which is temporarily the Mangrove Bay Sales Center, is a four-bedroom plus den, four-and-½ bath home with all primary living spaces (including the master suite, two guest suites, and a private den) located on the ground level and a private-entry guest house above the garage. The guest house features a generous sitting room, scaled-to-fit kitchenette, private bedroom and bath area, and private balcony. At approximately 3,640 SF under air, this model evokes a classic seaside cottage, with intricate trim details, a grand beamed, tongue-and-groove ceiling in the great room, and built-in upholstered bench seats which flank the whitewashed brick stone fireplace. The “charming coastal cottage” décor is finished in watery shades of blues and crisp whites grounded with traditional heart pine wood floors for a comfortable feel. Other key design elements include traditional bead board accents, bench seat reading nooks, cottage-style barn doors, and stacked stone for the second fireplace in the outdoor living area. This beautifully appointed home is available for sale. The Keewaydin II Waterfront Residence model — which is already pre-sold with leaseback — is a must-see. It has a total of four bedrooms and four-and- ½ baths, a second-floor loft area, and a private-entry guest house above the garage, offering over 3,700 SF under air. Its soaring two-story great room with a unique nickel gap wood ceiling has a focal point stone fireplace balanced by a stained entertainment built-in bar at the opposite end of the space. The kitchen’s exposed stainless steel hood boasts a quartz backsplash, the same quartz used in its waterfall island countertop. The Keewaydin’s ground-floor master suite offers an oversized sitting area with corner-pocket sliding doors overlooking the lanai, outdoor living space, pool, spa, and Gordon River. The master bath has a free-standing tub, oversized shower, and a separate makeup vanity, and morning kitchen. All 19 different elevation options at Mangrove Bay feature custom-crafted cabinetry, Thermidor appliance packages, natural gas feeds, private custom-designed pool areas, and more. 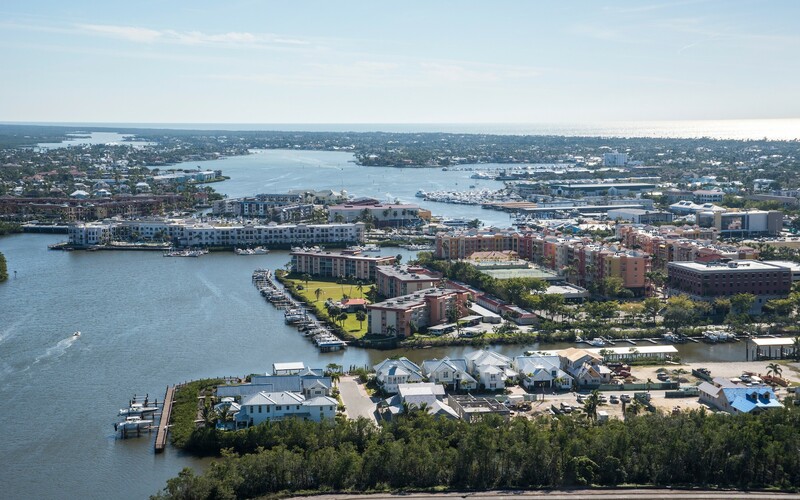 Residents have the benefit of resort-style living with an on-site Concierge Center, an owners-only boat ramp, and their own private boat slip. Complete pool care, landscaping, and dock maintenance are just a few of the services offered. Touring the model residences is the best way to experience Mangrove Bay and the extensive thought that went into their conception. The models are decorated by Freestyle Interiors, designed by MHK Architecture & Planning, built by Lotus Construction, LLC, and exclusively marketed by Paradise Realty of Naples, LLC. 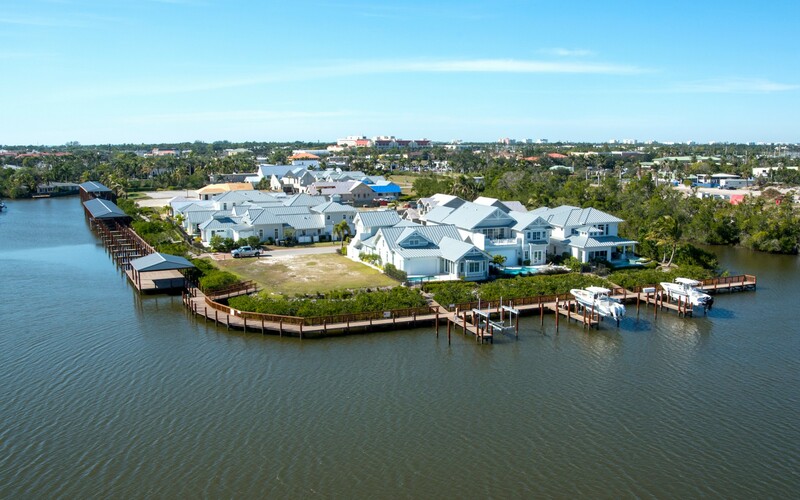 Learn more about Mangrove Bay by contacting the Sales Center (239.261.2200) and arranging a site tour, or visiting www.mangrovebaynaples.com. We look forward to seeing you at Mangrove Bay!